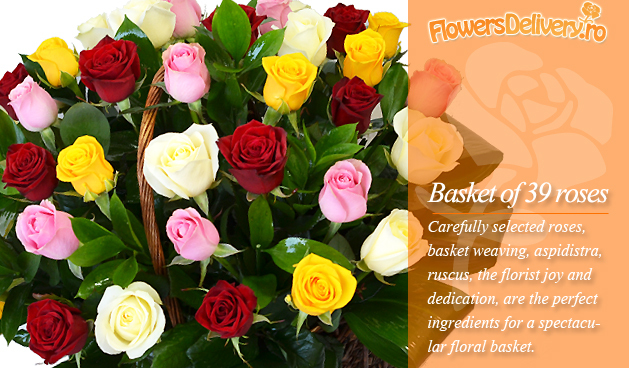 Flowers delivery Romania * Send flowers to Romania with same day delivery. Send flowers to Romania, including Bucharest, with local same day delivery. Online romanian florist with experience, send flowers online, with flowers delivery from the local workshop. Order flowers and bouquets to be delivered anywhere in Romania, including Bucharest, with same day delivery direct from the flowershop located in cities such as Bucharest, Iasi, Timisoara, Constanta, Arad, Cluj Napoca, Pitesti, Ploiesti, etc..
Our offer of flower bouquets includes a wide range of arrangements. We create floral arrangements for any occasion ( baptism, wedding ). Funeral wreaths and sheafs, made of natural flowers on traditional pine frame. We can make on demand any type of funeral arrangements: funeral wreath, funeral sheaf, funeral flowers heart, cross funeral in natural and artificial flowers. with us, the satisfaction is guaranteed! - Whatever your budget is, our bouquets get the same attention on making, transport and delivery process. "THOUSAND THANKS FOR QUALITY ORDER 0002XX. THANKS VERY VERY MUCH. ..."